The Heartland War is over now, a bitter battle over the sanctity of life. As per the new agreement, life begins at conception and cannot be tampered with until a child reaches the age of thirteen. However, between the ages of thirteen and eighteen, parents can choose to have their children “unwound”, by sending them to a “harvest camp” and having all of their organs donated to others. That way, life doesn’t technically stop; the teen keeps living, albeit in the bodies of many other recipients. If you are not able to raise your baby until he or she reaches the age of thirteen, you can “stork” it: leave it on someone’s door stop and run away. Finders, keepers, according to the law. This futuristic tale is riveting; built around an interesting concept and driven by strong, complex characters. Shusterman creates an elaborate world of these characters, and each one of them is interesting enough to merit a personal story. His universe is populated by the Clappers, a dreaded terrorist group, a wizened antiques dealer whose shop is a front for the unwind version of the Underground Railroad, and an eccentric who creates a large-scale shelter for unwinds in the middle of the Arizona desert. Everyone’s got a back story, and Shusterman lets us all in on it, which I absolutely love. Even though it is a complicated world, with a lot of unfamiliar political and social situations, it is still very accessible to readers. That’s a tricky balancing act for many writers. I really enjoyed that the story was not predictable, either. I was expecting a daring escape, but there is just no way to guess where Shusterman will take readers next. Awesome! 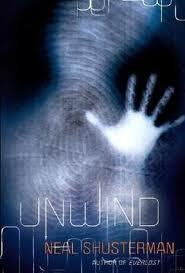 Unwind won two of the big awards: it’s an ALA Best Book, as well as a Best Book for Reluctant Readers. It also won about a billion state awards, including a placement on the Oklahoma Sequoyah Award list (my home state, folks!). This is a fast-paced, engrossing read that covers heavy topics like the definition of human life, reproductive rights, politics, the ethical concerns of organ donation for profit, and governmental power. I think you’re going to love it! And if you do, you’re certainly in luck, because there’s going to be a movie version released, and also, Shusterman has written a ton of other incredible books! So, while you’re waiting for the movie, you might want to try his crazy-popular Skinjacker series, which includes the books Everlost, Everwild, and Everfound. Shusterman, Neal. Unwind. New York: Simon & Schuster, 2007. 335 pp. Ages 13 and up. Posted on July 31, 2011 May 8, 2013 by ShannaPosted in Adventure, ALA Quick Picks for Reluctant Readers, ALA/YALSA Best Fiction for Young Adults, Dystopian, Futuristic, YA LitTagged abortion, big business, big government, fugitives, futuristic, organ donation, parent-child relationships, science fiction, Second Civil War, survival skills.